Are pretty pictures enough to entice iPad users? Probably. Microsoft has launched Bing for iPad, a tablet-specific version of its free iPhone app. 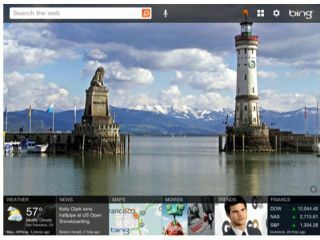 The visual-conscious search engine takes full advantage of the larger screen display, with the Bing homepage images displayed in all their glory. In terms of features, Bing for iPad is largely the same as its iPhone equivalent, and the Bing search bar is ever-present at the top of the app. As well as being able to, y'know, search the internet, the app allows you to swipe your way between touch-enabled listings, including news, local business results and trending topics. Bing Local and Map integration also offer bird's eye directions and real-time traffic information. If typing on the iPad is too much of a chore, the app also comes with voice activated search and image searches are returned in a grid view much like, er, Google's. No doubt Microsoft's plan is to lure iPad users away from Safari and its default Google search with this luscious new tablet app. Good luck with that.